The tractor guy pulled his load onto a scale, where the full weight would be recorded. 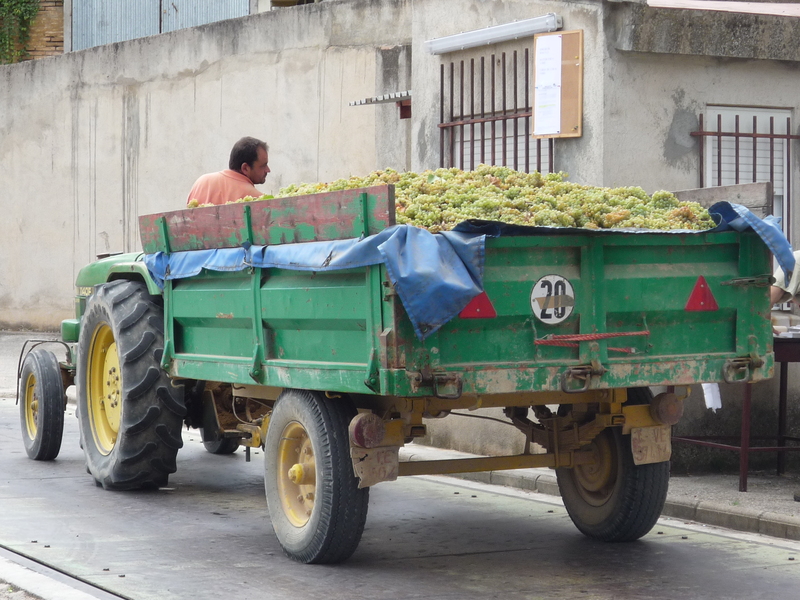 Once he unloaded the grapes, he pulled the trailer back onto the scale to be weighed again to calculate the difference. The co-op pays the farmer based on the weight of the grapes he delivers. 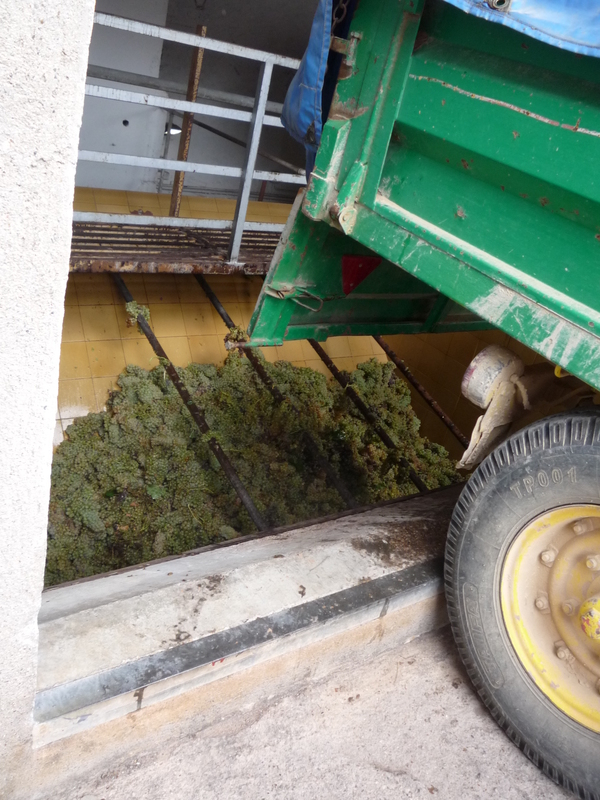 And then he dumps the whole shebang into the pit, where the grapes will be de-stemmed and pressed before being made into wine. Our tour guide for the morning was a demure, doe-eyed enologist, probably the most attractive enologist any of us had ever met. 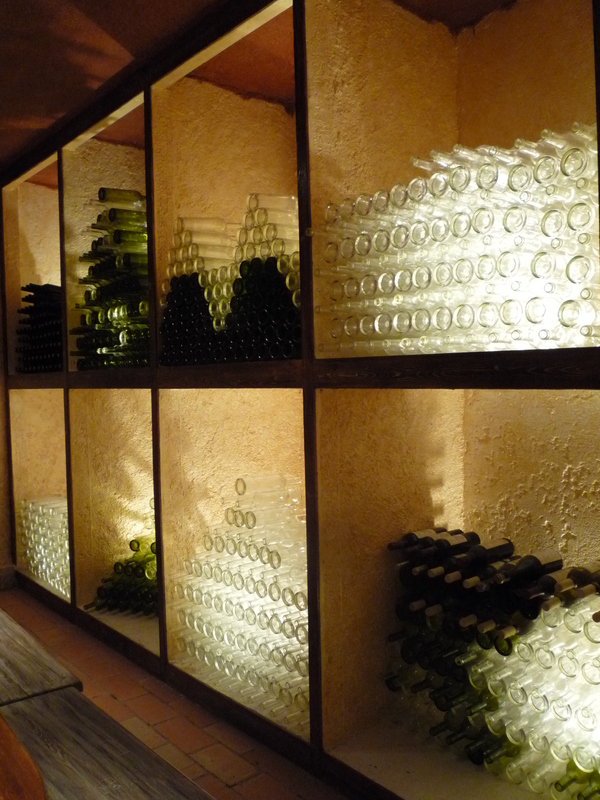 She took us around the co-op and explained how they made their eight or nine different wines. The actual winery part of the co-op was pretty standard, large stainless-steel tanks, a press, tubing everywhere, etc. These tanks, unlike others we’d seen in the area, had special temperature-adjusting collars around them to keep things cool. Kind of neat. 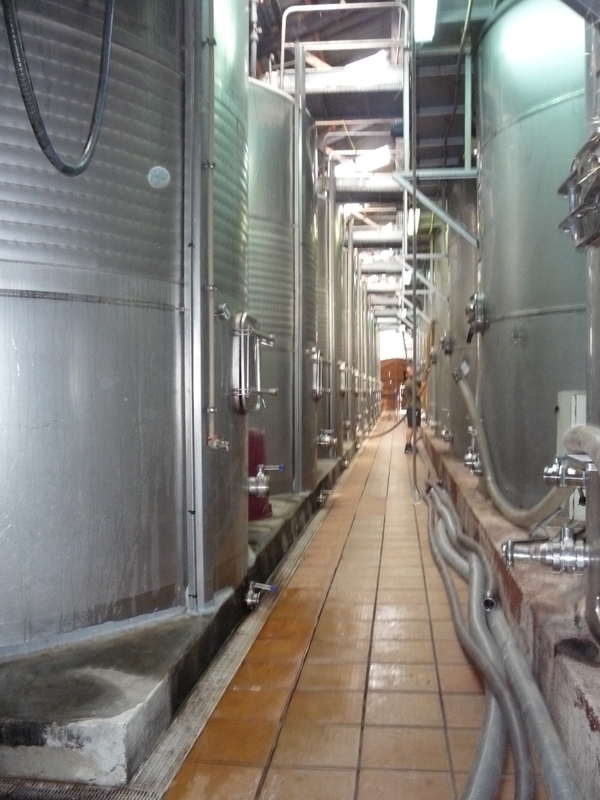 Now, my other Catacurian ladies, you’ll have to let me know if I get this part wrong…Our tour guide explained that, into the floor of the winery area, they had placed special huge holding tanks for the wine to hang out in once it was ready. This was a source of great pride, because those steel tanks had replaced what were basically huge stone pits. 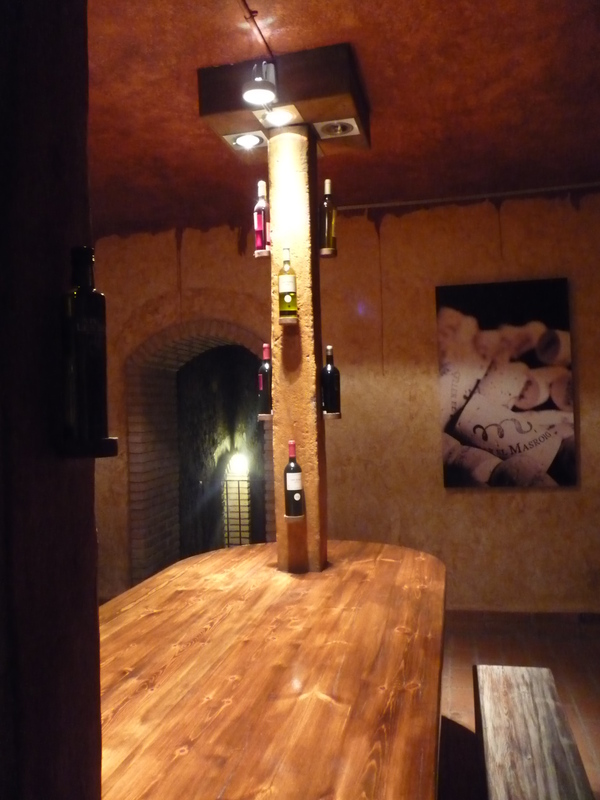 Before, wine was stored in the ground in those old pits, and they were a dangerous place to work in. Many workers actually slipped and fell in while cleaning the inside or performing some maintenance in the pits, and some even died. The cool part of this story is that now, the pits still exist, but they’ve been converted into gallery space for local artists. Our tour guide suggested we have a look at them, and we could hardly say no. 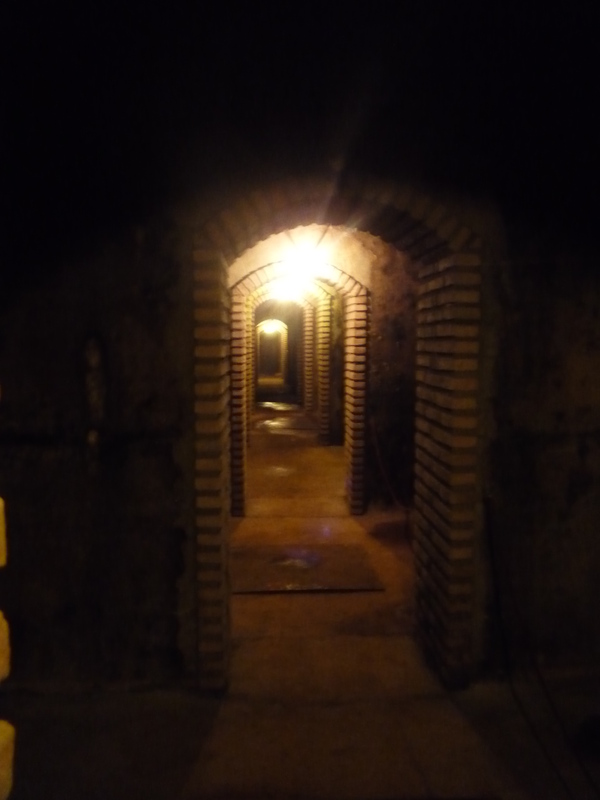 We felt we were walking into a medieval dungeon. 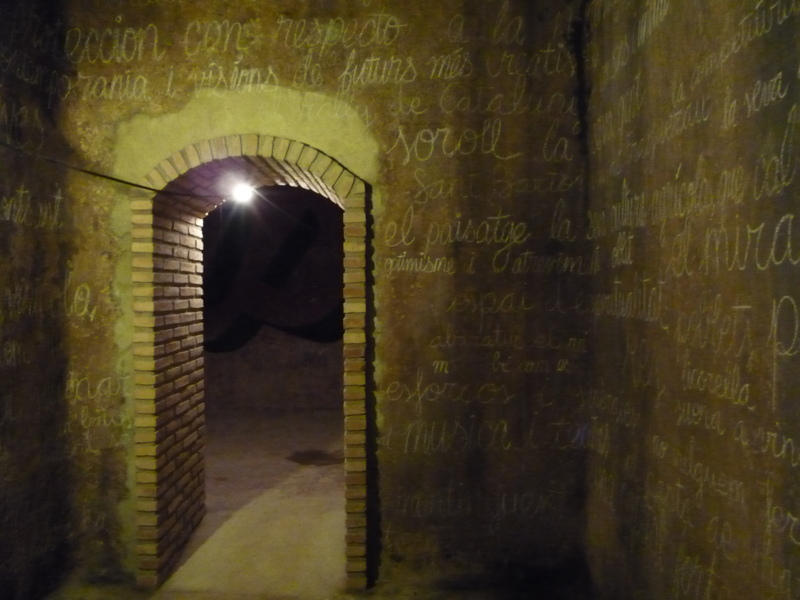 Here’s an example of one of the art installments – you’ll see words written inside the chamber in Catalán here. And here, a different artist used the natural formations and discolorations of the stone to create beach scenes, faces, and other visual delights. 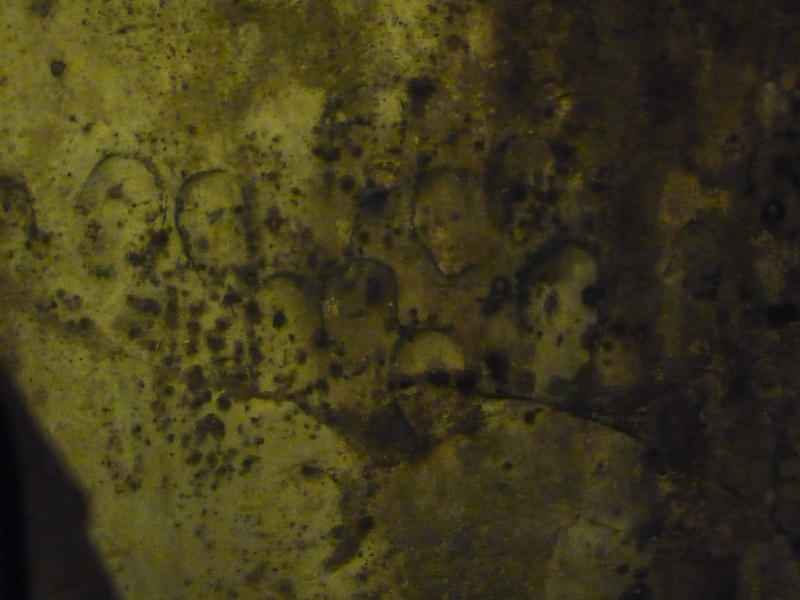 The faces were pretty creepy—see them? 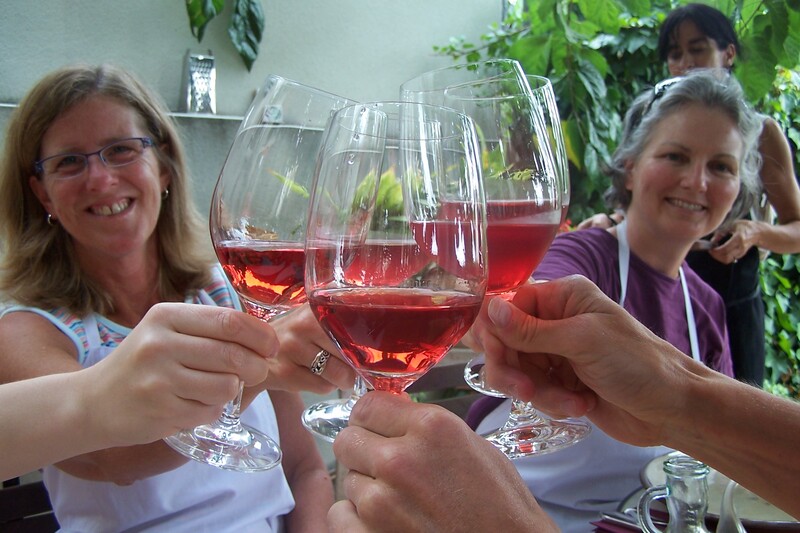 We tried a few wines, and were pleased to hear that some of the co-op’s wine is distributed in the US. 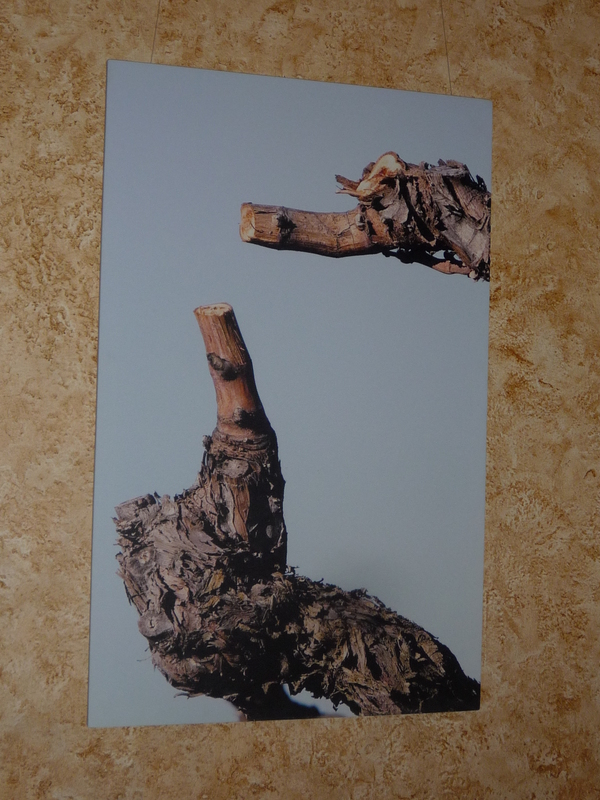 I got a kick out of this photo of grapevines, which reminded me of the Sistine Chapel’s iconic scene of the hand of God giving life to Adam. Oddly, I seemed to be the only one who linked Michelangelo to this photo – what do you think? We chatted, and drank wine, and chatted some more, and before we knew it, it was time to head back to Catacurian. Before we did, though, it was time to do a bit of shopping. I picked up some olive paté, some hazelnuts, and a few other goodies. As I waited to pay, I briefly reflected on the brilliance of plying us generously with wine before inviting us to spend our money. Then I added a three-liter (!) box of olive oil to my armload of purchases. Woo! 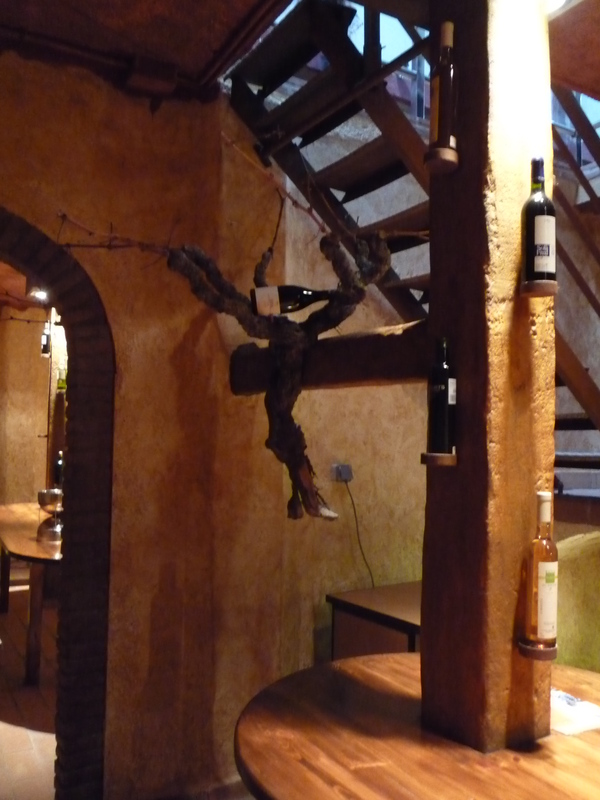 We wandered back to the Catacurian house to prepare for an early lunch. 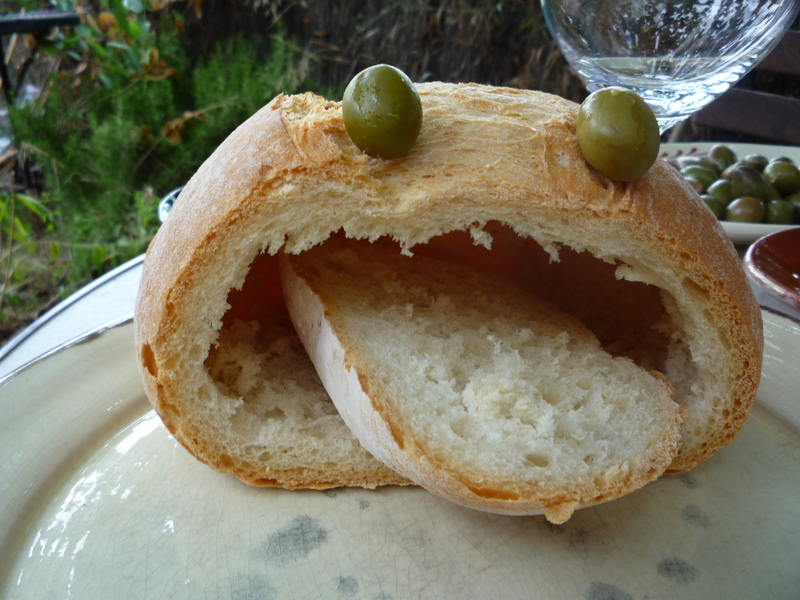 Today’s lunch would be a very special occasion: We would experience the “clotxa,” a traditional harvest-time meal. 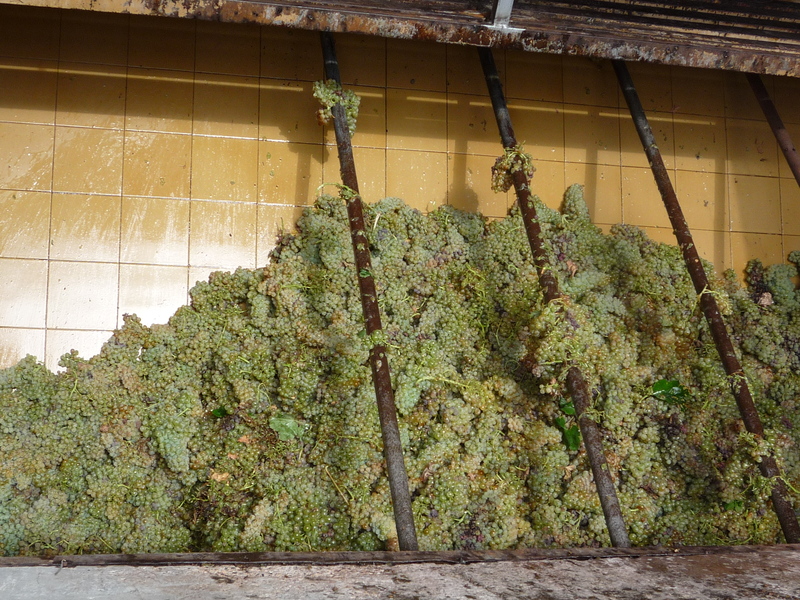 Alicia explained to us that, once the grapes are ready, they have to come off the vines as quickly as possible. In the Priorat and Montsant regions, the geography is typically such that tractors often cannot be used to work the vines, and so all the grapes are hand-picked. Obviously, this is an extremely time-consuming process (I think they may have said that one guy can pick half a hectare per day? My Catacurian ladies, does that sound right?). 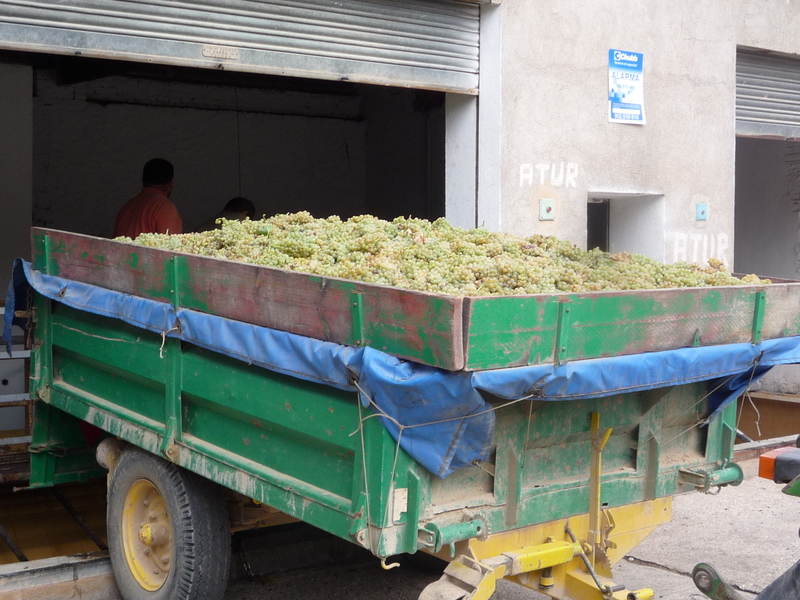 During harvest time, then, it is a race against nature to get the grapes off the vine very quickly, so the workers don’t have the luxury of returning to their homes for a leisurely lunch. They instead enjoy the clotxa. Alicia told us that clotxa (pronounced CLOTCH-ah) means “shell” in Catalán. While I couldn’t find any official confirmation about that definition of the word, I did find some information online which indicated that the clotxa was named in this way in part because the dish serves as its own container—that is, the workers pull out the innards of a loaf of peasant bread, throw in some ingredients (whatever they have on hand in the larder) that they will eat with the bread later, and then carry the whole meal in its own pocket out to work in the mornings. 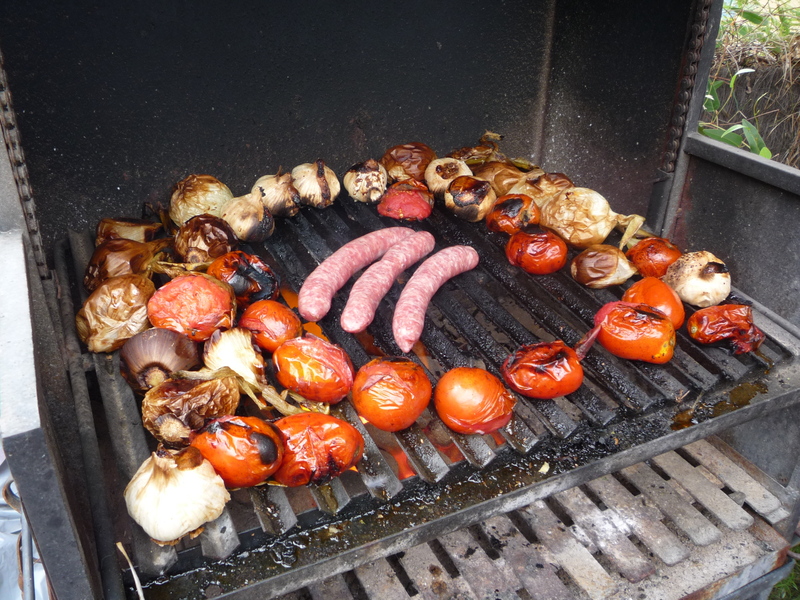 When lunch time rolls around, the guys build a fire and roast some tomatoes, garlic, onions, and herring. 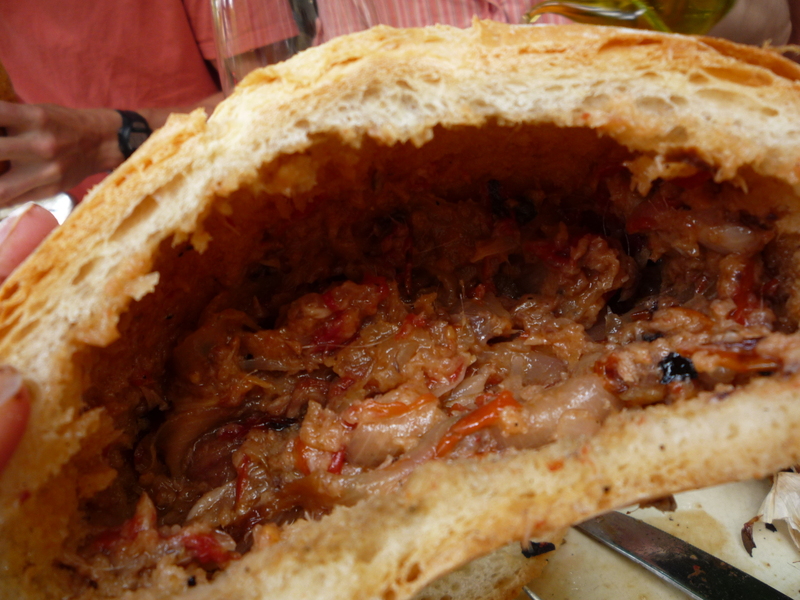 Once everything is cooked, they mash up the roasted veggies inside the cavity of their loaf of peasant bread, add the herring, add a TON of olive oil, and mix. Then, this gigantic sandwich is eaten for lunch, and accompanied by fresh grapes—conveniently located right on the vines where the guys are working. 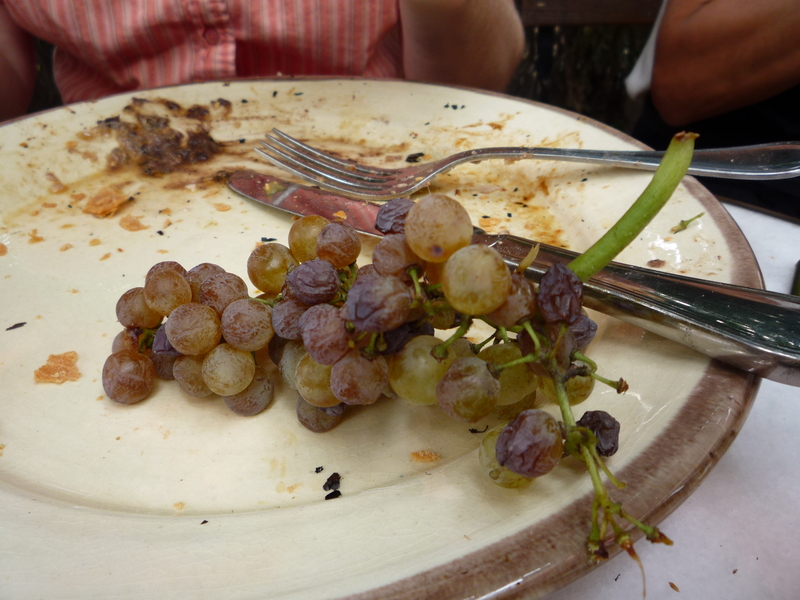 The grapes are a delightfully balanced counterpoint to the salty herring, and with such a gigan-tastic meal, the workers are prepared, bellies full, to work for the rest of the day. If you’re still dying to know more, and have Google translator at the ready, you can check out this site, and this site. 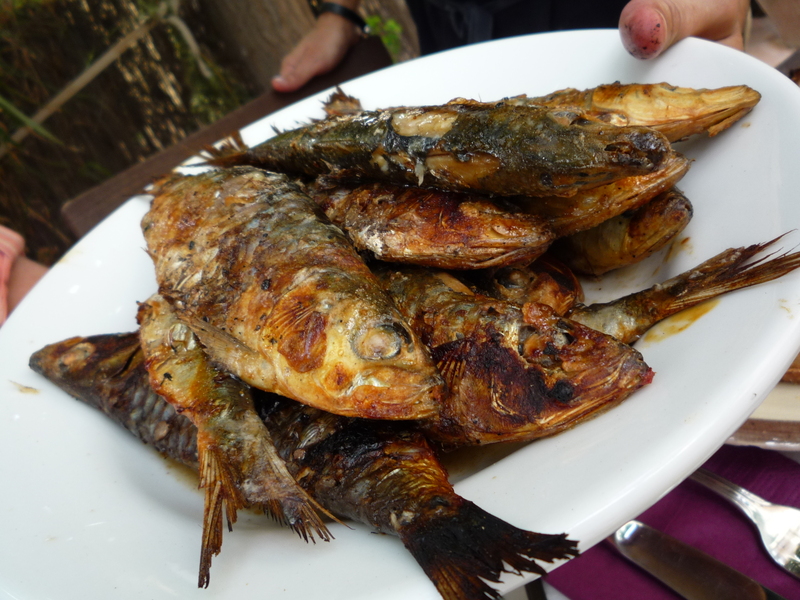 Alicia had warned us that it would be a disgusting job to eat our way through the clotxa – she regaled us with descriptions of oil running down one’s forearms, and bread that just couldn’t stand up to the abuse, resulting in a damp, oily mess in one’s lap. We were somewhat intimidated, but we jumped right in. How bad could it be, right? Mash everything together inside the cavity of the bread, and add a TON of olive oil. Then, add more olive oil. 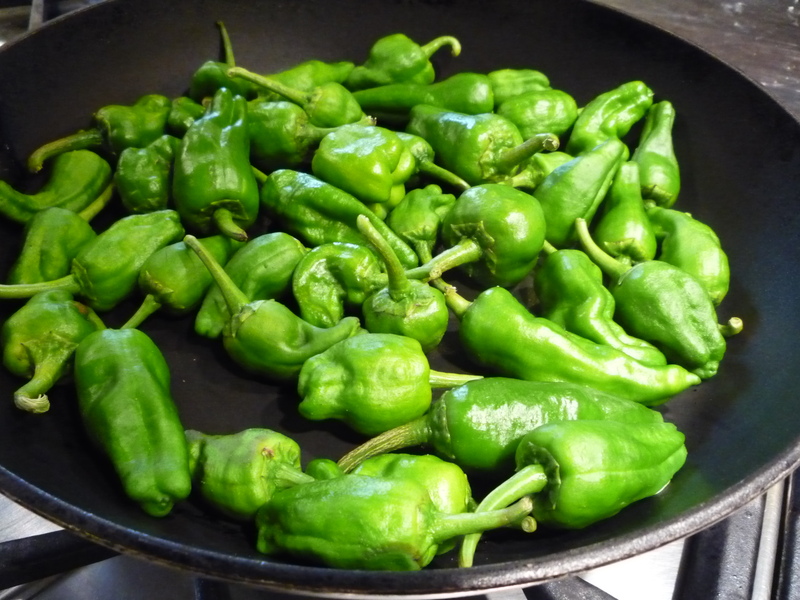 Stir vigorously to incorporate all the ingredients, and then add some more olive oil. If you think you may have added too much, you’re wrong. Add more. As a result of said oily mess, none of us managed to capture a single shot of exactly how huge each of these things is. When you see the bread on the plate, you don’t quite have the same experience as when you are actually hefting the two-kilogram gut-bomb in your own, two olive-oil-slicked hands. 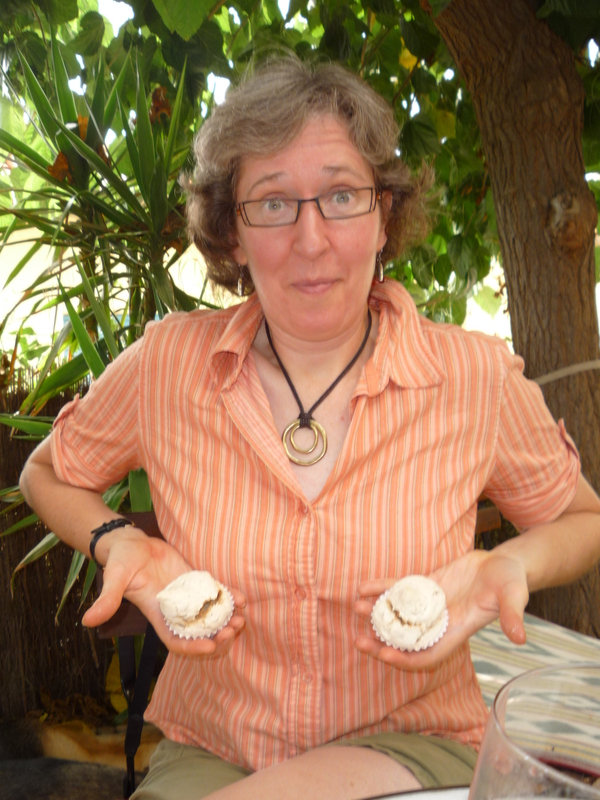 It is nearly larger than your head, and everyone knows you should never attempt to eat anything larger than your head. And everything was delicious. Surprisingly delicious. 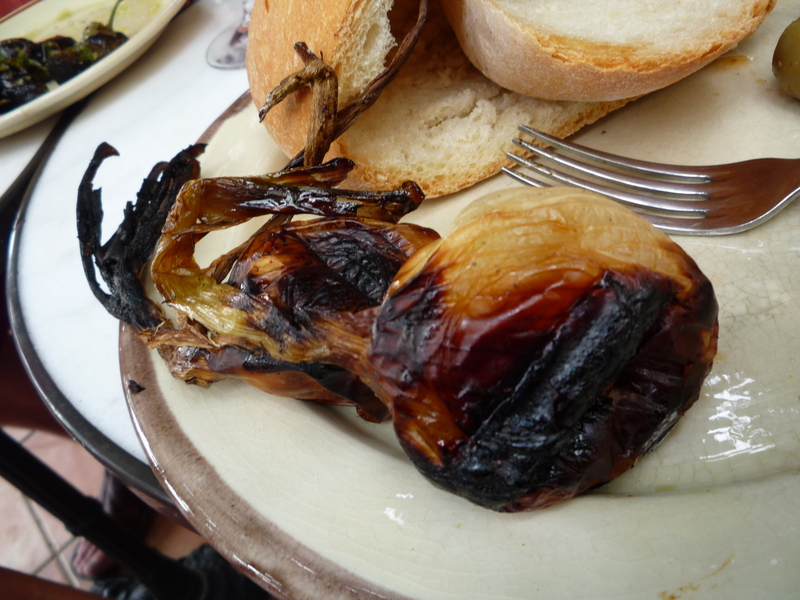 The roasted garlic and onion (kind of a cross between onion and leek, actually) were smoky from the grill, and the tomatoes had all caramelized into the most wonderful red packets of summertime deliciousness ever. The herring didn’t even frighten us – here’s to our first (and hopefully not only!) clotxa! Somehow, under what I imagined to be Alicia’s pride-filled gaze, I managed to eat the entire thing. I felt, in a word, miserable. I can’t remember the last time I felt so stuffed. 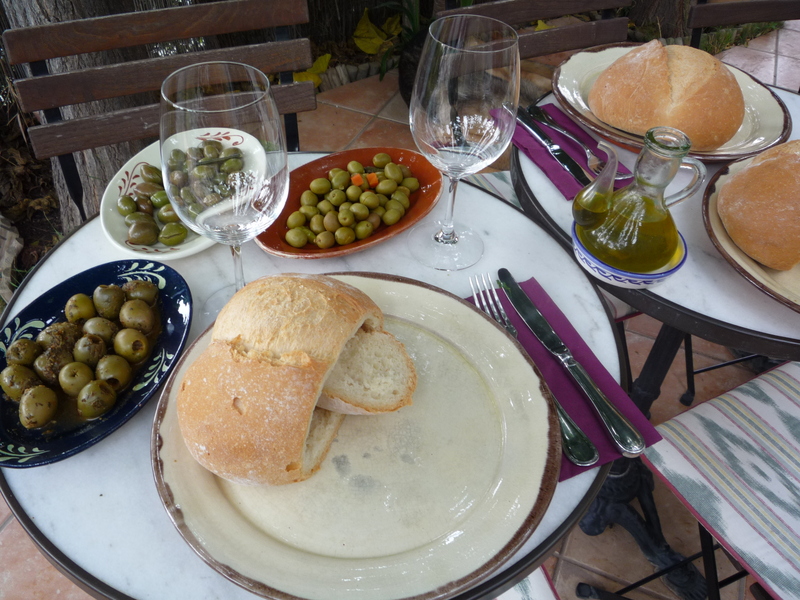 I had eaten a zillion pimientos de padrón, an entire bunch of grapes, and dozens of olives. We’d enjoyed copious amounts of wine. 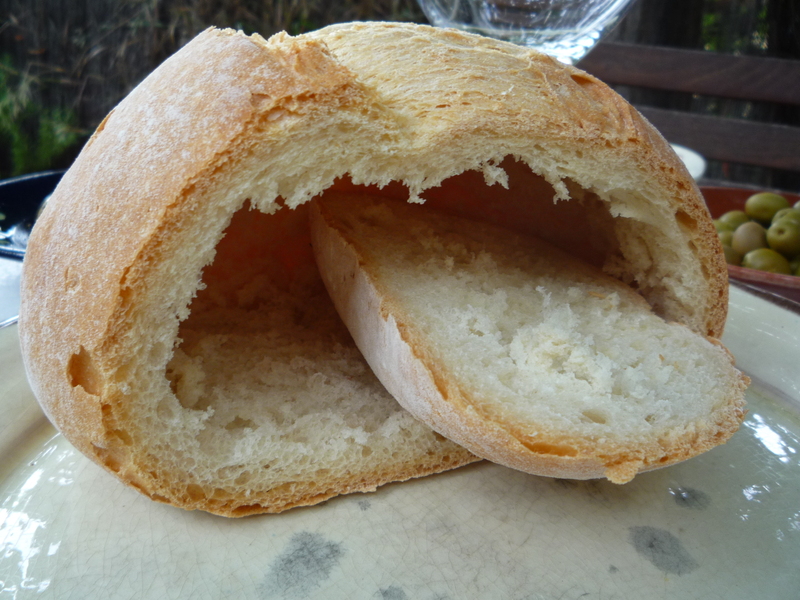 What’s more, I didn’t just stop with the clotxa and its insides, not I. I even managed to cram in the “lid” of the clotxa after I used it to scoop up all the goodies which had fallen out of my bread. On top of this, we had dessert as well. 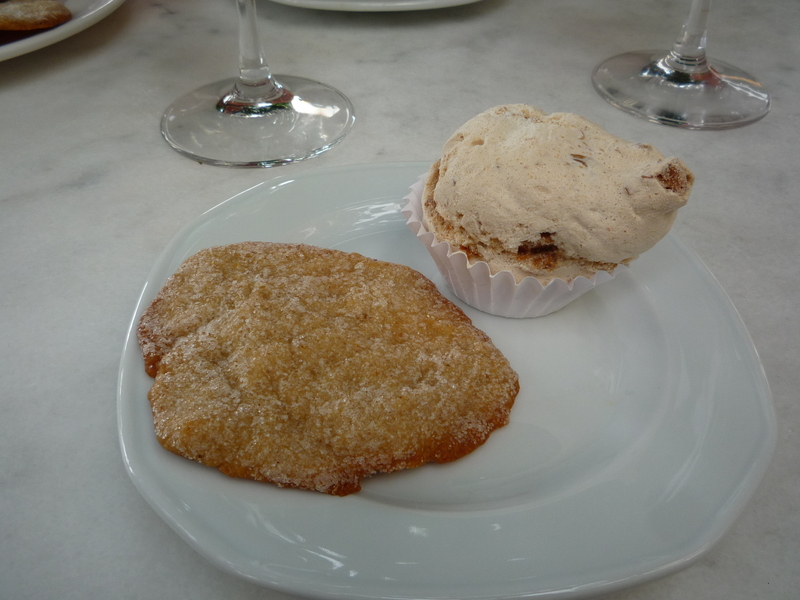 Two desserts, to be more specific: A dry, anise-flavored cookie-type thingie, and a candied-almond-filled meringue that was simply heavenly. 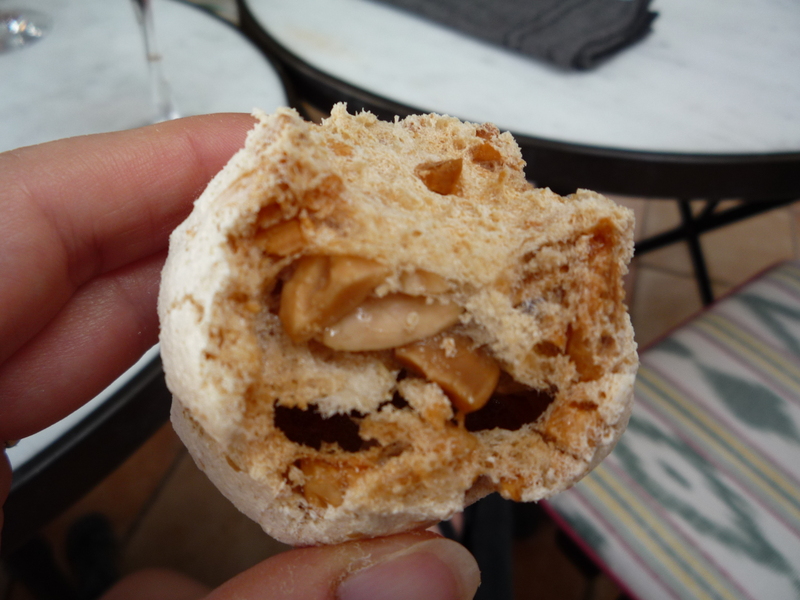 Here’s a look at the inside of the meringue, it was sooo yummy. My other Catacurian buddies felt full, but I didn’t think I could even manage to sit down again. I opted out of the after-lunch walk. I was afraid that, between my sudden-onset post-clotxa lethargy and my distended belly, disaster could be imminent if I did anything other than be very still. I opted to write for a bit instead, and managed to get our recap of Day 2 posted on the blog in spite of my near-constant belly-rubbing in an attempt to quell the discomfort. During our meal earlier, Michael had raised the question of visiting the local bar before we left town. Alicia had recommended a particular beer that was served there, named Rosita, and since we’d had such a good experience with the Voll Damm she recommended before, this was a very tempting proposal. I drank a beer once in my Aunt Gingie’s town of Sheridan, Texas (population ~790), but it didn’t really count as a bar since it was actually just a counter in the local feed store. So my curiosity was piqued: what would a bar in a 400-person town be like? Nevertheless, the more pressing current question at hand was: Where on earth was I going to find the space to fit a beer in my innards? This I pondered while I waited for everyone else to return. By the time they all got back, I felt I could find room for a few sips of a beer, and that was enough to convince me to join the party. 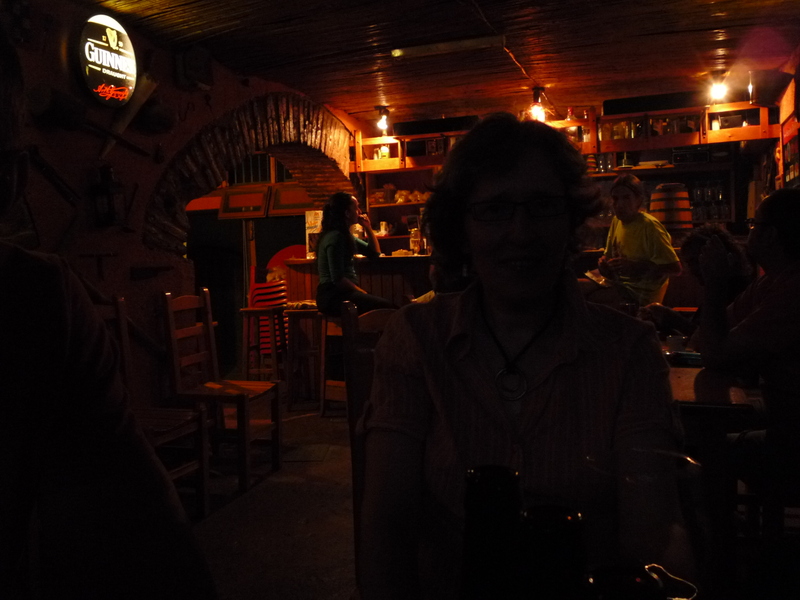 We walked around the corner to Tere’s restaurant. Tere was an older lady who happened to be a good friend of Alicia’s mother (in her 80’s!). Alicia had called her to let her know she might have some additional clientele visiting that evening. 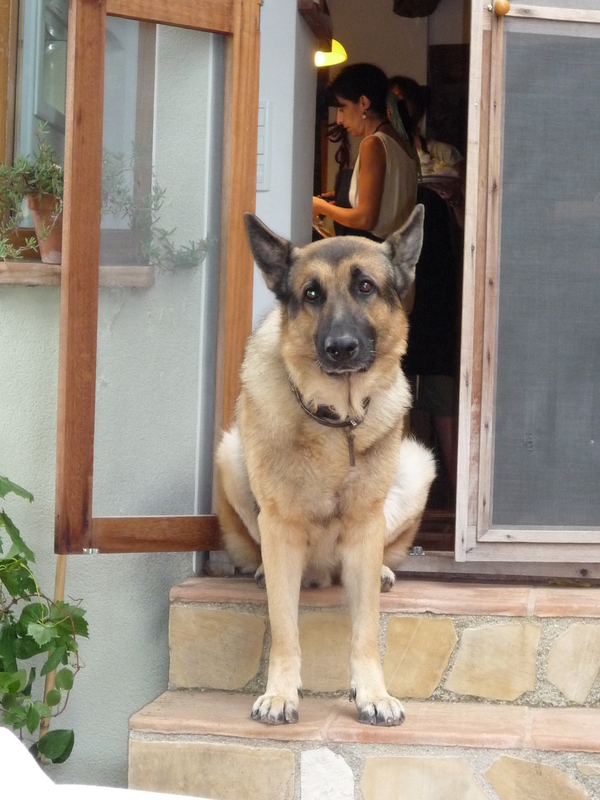 Tere was a hoot, and greeted us warmly in Catalán-tinged Spanish. She ushered us downstairs to the basement, where the bar was located, and we headed down. We ordered our beers, and wrinkled our noses at the thick cigarette smoke. That is, we wrinkled our noses at the smoke until we were assaulted by someone’s hideously fuerte body odor. It seemed to emanate from a guy who looked like Rod Stewart’s ugly, mulleted younger cousin, seated at the bar in ball-sack-exposing, short denim cutoffs and an orange surf shirt with the arms cut out (presumably for better ventilation…?). He looked as if he could have been from Pasadena, or maybe even grown up on my street. He could be a distant cousin of the Huffmans, I mused. I marveled at the fact that daily patrons of neighborhood/divey bars in two different countries could look so darned similar to each other. My reverie was violently interrupted by a fresh wave of grodiness when Rod Stewart’s Ugly Cousin raised his arms to gesticulate at something on TV. Yech. In spite of this, the beer was great. We found out that the bar served three Rositas: “Ivory” at 4.5% alcohol, “Artesan” at 5.5% alcohol, and “Black with hazelnuts” at a whopping 6.0% alcohol. We tried all three, and they were all quite tasty. My favorite was the hazelnut one – see how dark and delicious it looks? 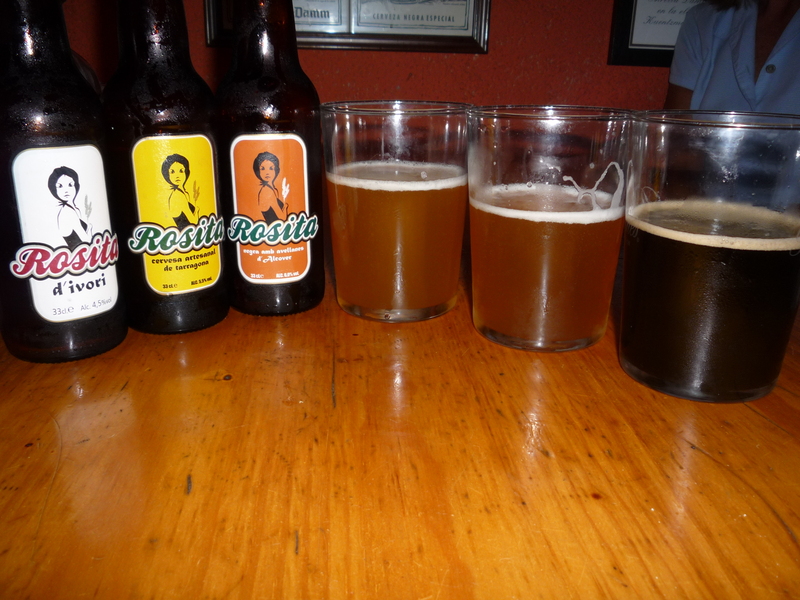 We aren’t the only fans, however—Cerveza Rosita even has its own Facebook page. Whoa! We hung out for a while, and headed back home to pack up for our early-morning departer. Boo! Somehow, I’d arrived with a medium suitcase and a small carryon bag, and was leaving with a medium suitcase, a small carryon bag, a fully-packed backpack, a briefcase of wine, and a large shopping bag. Sheesh. The next morning, we had a rushed breakfast, and we headed off to the airport. Our time at Catacurian had, sadly, come to an end. A wonderful time was indeed had by all. Adéu, El Masroig! Adéu, Catacurian! Until we meet again…Y ¡qué sea muy pronto! Thanks for your great entries (entrees?). We’re off to Catacurian next week for the 6-day program. We can already taste the dishes due to your great descriptions. Enjoy, Bob! And please give my best to Alicia and Maite! Have a wonderful time at magical Catacurian, and thanks for reading!! !